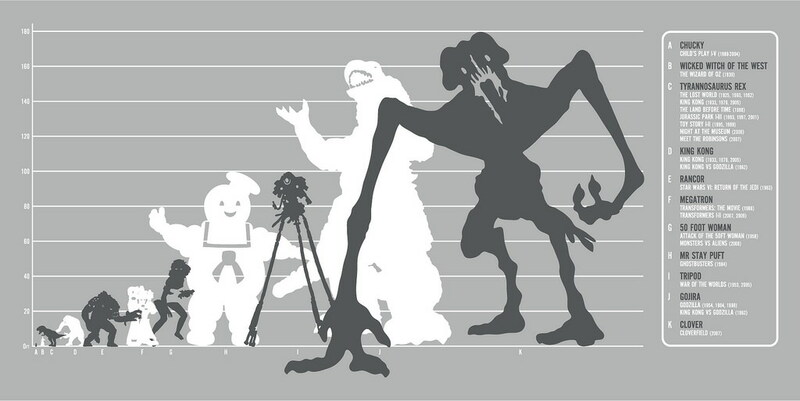 So it seems like the monster movie is still going strong thanks to such films as Troll Hunter (2010), Cloverfield (2008), King Kong (2006), The Host (2006) and now a new Godzilla flick about to drop in 2014 (the second Godzilla film to be produced and financed by an American film company). But has our favourite city-smashing monster cruched his last building as well as the office fitout niche? After receiving a fresh copy of the Godzilla Millennium box set from Madman and pondering how many actual incarnations of the Godzilla canon have been unleashed, I decided to actually answer the question for my own amusement and yours. The word Godzilla actually translates to Gojira - a portmanteau of the Japanese words: gorira ‘gorilla’, and kujira ‘whale’, alluding to his size, power and aquatic origin. 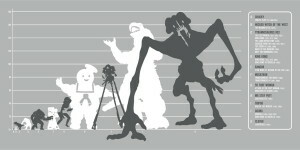 Godzilla is without doubt the king of monsters! Featuring in over 25 films and doing battle with everything from giant moths to robotic versions of himself, Godzilla has lived a large and lucrative life. Godzilla hit theaters in 1954 and garnered a budget of around $250,000 before securing large box-office revenues in Japan and America. It was produced by Tomoyuki Tanaka and directed by Ishiro Honda. 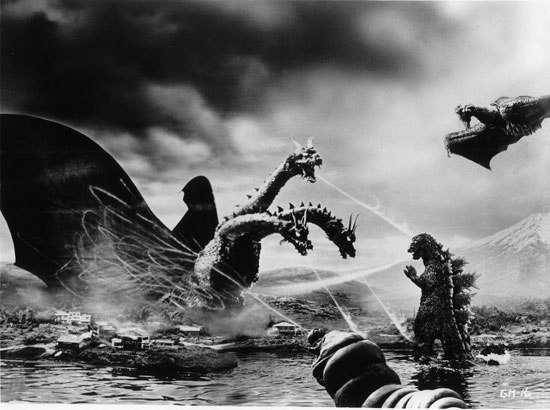 The film is considered a classic and one of the greatest monster movies ever made, as well as a powerful and evocative nuclear allegory. After the nuclear bombings of Hiroshima and Nagasaki a powerful theme throughout its history is derived from visual and psychological references to the atom bomb. Godzilla is not only radioactive, but after he smashes through a city, the ruins are quite reminiscent of how nuclear war crippled the world. 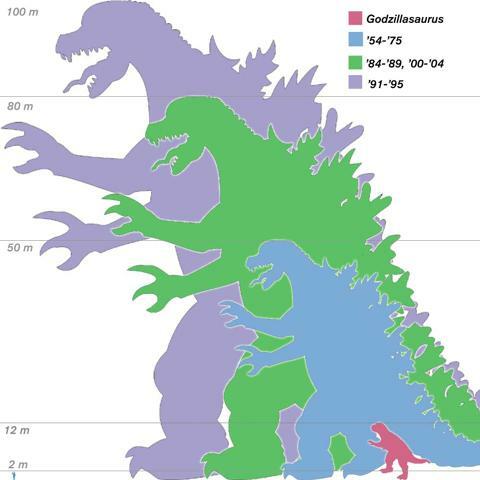 Godzilla actually did battle with another famous movie monster, King Kong in 1962 however according to the below chart, it should have been a fairly one sided event. The giant lizard in most accounts is cast as a villain but in Ghidorah, the Three-Headed Monster (1964) we see the beginning Godzilla’s gradual change from villain to hero, as he saves the Earth, and therefore humanity, from the evil space monster, King Ghidorah. With Japan constantly being trashed by old lizard lips, Son of Godzilla is the only Godzilla film where Japan is not presented as the setting. 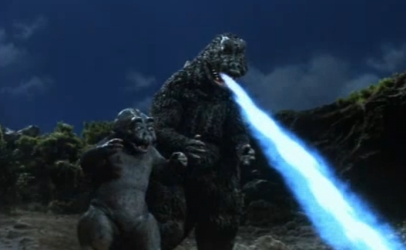 In contrast to previous films in the series, All Monsters Attack (1969) is openly aimed at children. As such, most reviewers have distinctly negative impressions of the film. Because of the crash of Japanese cinema and the energy crisis of the mid-to-late 1970s (which had also affected some television shows), the Godzilla film series was forced into hibernation. The 80s produced one of the most peculiar incarnations to go up against our favourite walking whale ie. 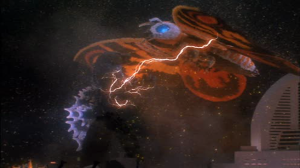 Biollante (a giant flower), but soon enough he was back fighting old foes including Mothra and Ghidorah. Special effects quality naturally evolved through out as did Zilla’s overall look and size. In some pics it looks like he had been working out over the winter (yea, he does his squats) and in others he looks rather cuddly. The American version totally revamped him giving him a more reptilian edge via a longer snout and more lean build. But his lust for destruction and radiation breath fuelled mayhem never changed – we will always love ya GZ.